Here is a baked cod recipe that is quite authentically Portuguese. 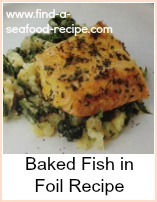 Any white fish of your choice will do for this recipe. I like it with monkfish as well- this recipe will serve 4. If you want to make it for more people, increase the ingredients proportionally, but it's best if you can get an oven proof dish so that the fish steaks or fillets fit in one layer. It's very quick to prepare and cook - the sort of baked cod recipe that you could just throw together when you get in from work - serve it with crusty bread and butter to mop up the sauce for speed or some buttered new potatoes and green vegetable - the sauce is 'built in'. 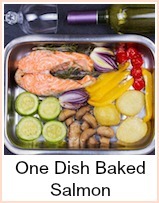 Preheat the oven to Gas Mark 5, 375F or 190C and grease an ovenproof dish - preferably with a lid. Fry the onion, garlic and pepper in a pan to soften. Add the tomatoes and paprika and simmer for about 5 minutes until the sauce is thickened. Taste and add salt and pepper if required. 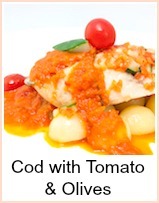 Put your cod in the dish, pour your tomato sauce over and bake in the oven for about 20 minutes until the cod is cooked. If you don't have a lid, then cover with aluminium foil. Sprinkle the parsley over and serve - a delicious, simple recipe for you to enjoy. You could use fresh tomatoes, which you would need to skin and chop. As the flavour can be a little acidic, I would recommend you add a tablespoon of tomato puree and maybe a teaspoon of sugar. I tend to use Italian Chopped Plum Tomatoes as the base for all my tomato sauces as they have a richness of flavour which is lacking in fresh tomatoes. In Portugal you will often get little cubed fried potatoes served with most dishes– they are quite easy to make. You just cut them up into sticks as you would for fries, then cut them across into cubes. They need around 30 minutes shallow frying. 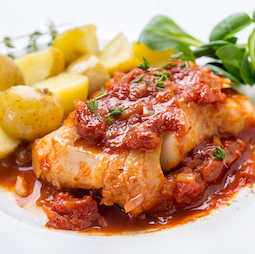 A delicious, slightly spicy baked cod Portuguese. This dish is very quick to put together and has a sauce 'built in' making it easy to serve with either crusty bread for quickness or some plain buttered new potatoes and green vegetables.